Today we completed day two of walking and it’s amazing how close everyone has gotten since we arrived in Spain just 5 short days ago. Walking the Camino is especially nice because it gives everyone a chance to talk in smaller groups of maybe two or three, really getting to know each person individually and more personally. Walking and being surrounded by beautiful flowers, I especially love the Poppy flowers, and mountains in the distance is exactly how I imagined this trip. Somehow it’s even more beautiful than I imagined though, I have noticed that cameras can’t capture the raw beauty of the Spanish countryside that we walk along each day. One of the most interesting times on the trail today was when the trail split into three paths, each marked with supposed yellow arrows, but some looking a little more fake or makeshift than others. We managed to find the right direction and forged forward, quickly to stumble upon the beautiful Roman bridge. The atmosphere of today was much different than yesterday, at least for me. Walking I took my time, and stopped to take pictures and really enjoy the outdoors. At the Albergue it is much more relaxing, and I was so pleasantly surprised to find an easel with unlimited paint supplies and canvases. The Albergue is decorated with these paintings that fellow pilgrims have made, which I find to be very special. Tomorrows going to be another long day, but definitely a fun one at that. I continuously look forward to getting to know the fellow Hokies and other Pilgrims as well as the Spanish culture. Although we have been in Spain for five days now, today marked the beginning of our journey on El Camino. As the Camino runs straight through towns and cities, we began immediately upon stepping out of our hotel in Leon. As with most things, the best part of the Camino is the people. It takes a certain type of person to be a peregrino, just as it takes a certain type of person to be a Hokie. There is an old Spanish proverb that reads: “Dime con quien andas, y te dire quien eres.” Those who are both peregrinos and Hokies are people with whom I am very proud to walk. But, of course, it is not just us walking the Camino this summer. It took me exactly one hour on the trail to make friends with a kind Londoner on a soul-searching trip across 3 continents by himself. He stuck with us for a few hours. After all, even the peregrinos who begin alone certainly do not remain so for long. After checking into our first albergue, I was pleasantly surprised by the accommodations (think sleep away camp bunks). The coolest part, though, is the walls. Countless peregrinos have left quotes, messages, and more in almost just as many languages. I left my favorite Mark Twain quote. We even found a few messages from Hokies past. It is so humbling to see how many peregrinos have come before us and so inspiring to look at the remaining blank spaces and imagine the peregrinos to come. Today, on the first day of the Camino, I realized that the peregrinos bond mostly over blisters. The things that people remember the most are names and blisters. Of the 4 to 5 pilgrims that I spoke to today, the consensus was that most of the peregrinos are friendly no matter their cultural background. A Canadian couple told me of the dinner that they shared with a Korean couple, who didn’t speak a word of English. Together they enjoyed chicken curry with rice and, a Spanish favorite, potatoes. 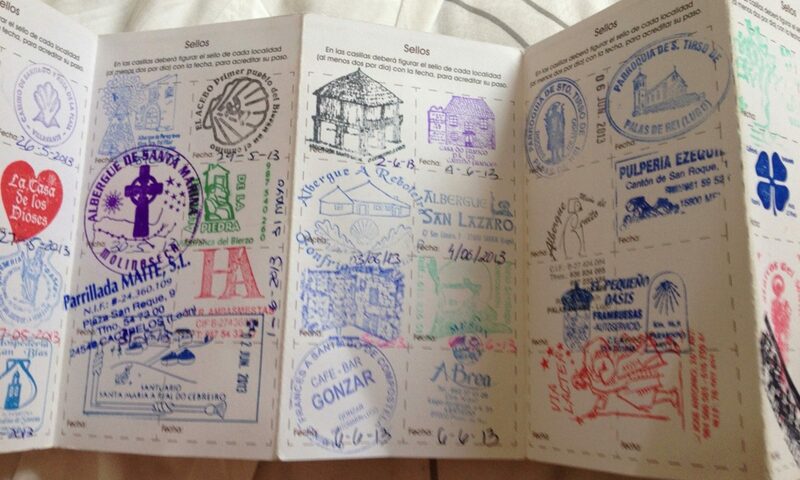 I think that experience speaks of the magic of the Camino. Personally, the day was fairly easy; I expect things to get a rougher as we get sorer. I got two blisters but they’re very small and tomorrow I will be using different shoes in order to see if that help. I’m both looking forward and nervous for what’s to come, but with every peregrino conversation my confidence grows. When Dr. Hesp asked me to meet her in Bruggers just a couple hours after submitting my application to VT Camino, I never imagined that a couple months later that I would be experiencing what I have in the last 5 days of this program. In these few days I have gained a much greater understanding of the culture, society, and language of Spain and even Latin America as well. As a civil engineering major with additional minors in history, green engineering, and leadership studies, I have been able to expand my global understanding and comprehension in all of these fields in addition to making what I confidently believe to be life-long bonds with the other Hokie peregrinos of our group. I look forward to the next four weeks with friends in this wonderful country.